HARTFORD, Conn. – For 48 hours, Ja Morant held the country captivated by his resplendent skill set in the NCAA tournament. He dashed his way into the American sporting mainstream in a manner befitting of his electric first step, as Patrick Mahomes, Luka Doncic and Dwyane Wade all paid their respects on social media. The end for No. 12 Murray State and Morant came swift and cruelly on Saturday night, as No. 4 Florida State blasted the Racers 90-62. It left the final image of Morant in this NCAA tournament as a searing one, his head buried in a towel on the bench after he exited the blowout loss with 1:35 remaining. The towel hid his tears from going viral. The moment captured the pain that accompanied the end of Murray State's remarkable season. The Racers finished 28-5 and lost for the first time since Jan. 31. In near certainty, it also marks the end of Morant's career at Murray State after two seasons as he'll be a high pick in the upcoming NBA draft. Morant stressed that he'd yet to make a decision on the NBA. He said he'd talk to his parents when the time came to decide whether to enter the draft. But his teammate, Darnell Cowart, summed up Morant's decision by asking a reporter: "Would you leave?" 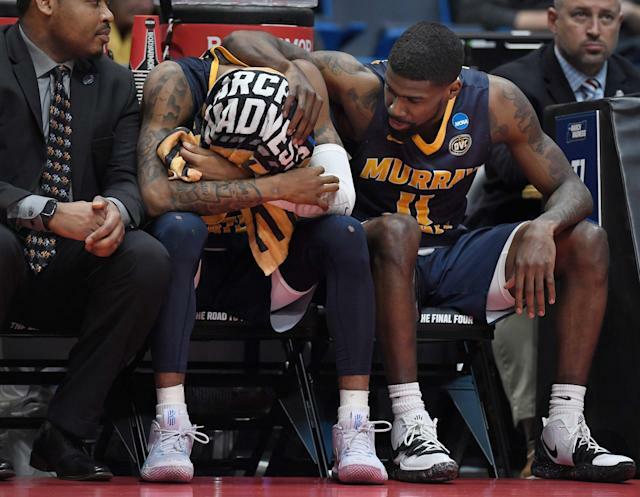 Murray State coach Matt McMahon saw Morant crying on the bench and knelt next to him to deliver a message of what he's meant to the school the past two years. "I just thanked him for what he's done, not only for our program, not only what a joy he's been to coach this season and through the whole recruiting process, but thanked him for what he's done for Murray State University," McMahon said. "He's been an incredible ambassador for our school, for our community, and has really shined the light on the great tradition we have at Murray State." Morant is projected as a top-three pick in the NBA draft and may have positioned himself in the top two after his triple-double in a blowout win over Marquette in the opening round. His legacy at Murray will be that he somehow took a small school in rural Southwestern Kentucky and ushered it into college basketball's mainstream. While shining a searing spotlight on tiny Murray, Kentucky, Morant never changed. "His pride and love for the university will be his story," said Murray State assistant Casey Long. Morant politely declined a question about his timetable for making an NBA decision. "I'm not focused on that right now," Morant said. "I just want to celebrate a wonderful season with my teammates." Morant hit his first five 3-pointers against Florida State, but ended up shooting just 8 for 21 from the field. He scored 28 points, but Florida State players were thrilled to hold him to just four assists. He'd delivered 16 assists against Marquette, and the Seminoles’ game plan revolved around not sagging off to help on Morant and making sure his teammates didn't beat them. "Our game plan was to take away his options passing," said FSU forward Terance Mann, who guarded Morant much of the night. "Our game plan was to let him score. We knew eventually that's not the way they want to play." Morant shot just 2 for 9 in the second half, as FSU's length and depth appeared to wear he and the Racers down. He said the emotion when he left the game revolved mostly around this group playing together for the final time. "I was just thinking about what I could have done to help us come out with a win and extend our season," he said. "I think that's what hurt me the most, not being able to take the floor again with this group of guys." Morant clearly treasured the run, as he took down his locker-room nameplate from the XL Center as a memento. He appreciated being part of an NCAA tournament victory, just the fourth in school history. "I feel like it was an opportunity for us to show the world what we're capable of, coming to the tournament and getting a win," Morant said. "It shows that we have a great program."